Nautical dinnerware is so fun to decorate with. It can be an accessory to a decorating theme, or it can be the main attraction. Either way, I'm sure you will find some interesting patterns here, in the Dinnerware Shopping Guide. Dinnerware for a nautical theme might consist of palm tree dinnerware, seashell dinnerware, lighthouse dinnerware, tropical dinnerware, beach dinnerware, or just nautical features like a ship, navigation tools, fish or sea life, and so forth. All of these things fit together to make up the definition of nautical which relates to ships, navigation and sailors. 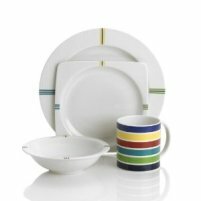 The Nautica Arctic White Dinnerware Set is a nice set that accompanies nautical décor. Actually, from time to time, Nautica distributes trendy patterns that seem to be perfect for this decorating theme. The Thomas Paul Scrimshaw set of side plates coordinates nicely with the Artic White pattern and several other dinnerware sets. It also comes with blue as the primary color with white accents. If your dishes will be used outdoors or actually on a boat, you might be looking for somewhat unbreakable dinnerware. In this case, you might be interested in a melamine dinnerware set like this Galleyware Dish Set . It is pretty attractive for a melamine set. If you are interested in fine china that fits into a nautical theme, you can always depend on Lenox. The Hancock pattern is very nice and makes a great table setting. The SUSQUEHANNA GLASS NAUTICAL COMPASS COLLECTION Stemless wine glasses make a great addition and brings about the theme. I really like nautical décor and the nautical dinnerware that goes along with it. I'm honestly thinking about opening a nautical décor website using Site Build It!. It is pretty awesome to make money from home by dabbling in topics that you have a passion for. I love it!